I had a terrible performance experience as a child. I was a 4 year old Suzuki student in a fluffy pink dress on stage in front of 300 people… and I couldn’t remember my piece. I’ll never forget the image of my piano teacher huffing up the aisle hissing “D! It starts on D!” At that point, in my nerve-induced stupor, ‘D’ meant nothing to me. It was horrifying. This experience changed my life as a piano student. The sinking feeling of failing on stage (and the annoying “Next time you’ll do better dear” comments at the reception afterwards) stayed with me. Even at 4 years old I promised myself it would never happen again. As a piano teacher it is my top priority during recital and exam season to do all I can to prevent this same experience from happening to my students. I spend copious amounts of effort and time preparing them in as many ways as I can; I know how badly a botched performance stings! And I’ve had immense success with a piano teaching tip that has completely changed the way my students prepare for performances. Before a performance, my piano students spend a lot of time away from the piano. Yup… away from the piano. In fact, they happily report back to me just how many minutes they have spent not playing the piano. Crazy? Some would think so… however, my students are actually practicing in one of the most efficient ways I have found to commit a piece to memory. Before a performance, my students are spending time playing their piece – but on a flat surface… not on the piano. They tap their way through their piece, playing exactly as they would on the keys, but with no sound involved. They still play hands together, with phrasing, with dynamics, in the same hand positions as they would on the keys, but it is all done on a table top. Why Does Tap Practice Work? 1) While there is no sound involved, your students will still “hear” their piece. The human brain is a wonderful thing – and your students will be developing their ear in leaps and bounds. As they are learning to hear their piece without the ability to actually hear it, their memorization of the piece will be much stronger and much faster as they force themselves to commit it to their aural memory. It’s wonderful to watch your students Tap Practice and then stop abruptly and say “Ooops.. I made a mistake!”. 3) Kids think Tap Practice is fun! This is one more way of making piano practice fun. Not only is it completely portable, meaning that your students can Tap Practice literally anywhere (my students Tap Practice on the back of a book in the car, on the table of a restaurant… you name it!) but it’s also enjoyable; they love the notion of playing the piano in their mind. Tap Practice takes a bit of … well.. practice! Start off with music much simpler than the level at which they currently play to get their brain in tune with their fingers. Some students benefit from humming along as they Tap Practice, but eventually you want them to be hearing the music in their mind only. 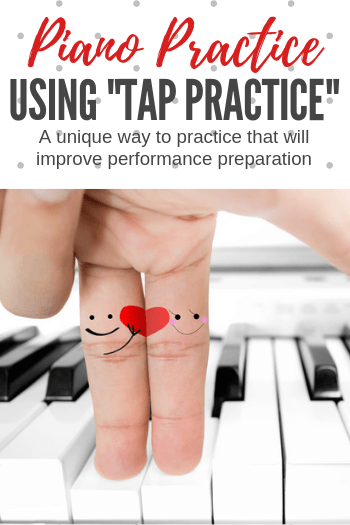 I even do Tap Practice sight reading exercises – your really musical students will know right away when they have made a “mistake” even in a piece they have never heard … it’s rather wonderful to watch! Give it a shot – not only have you expanded practice time opportunities by making it a moveable activity that can be done anywhere, but you have also tapped (pun intended!) into a new way of accessing the brain’s ability to learn to play the piano. Piano Teachers Who Make $100 Per Hour? You Can Too!